If I could pick one single thing I’ve done in the last four years to improve my life, it would be taking Tag out on our first date. If I could pick a second thing, it would be starting this blog. I mainly consider this blog a hobby, but it has turned into a side business as well over the last few months. I’ve actually pulled in over $6,000 of revenue in the last eight or nine months, which has been really helpful in paying off student loans and increasing my net worth. 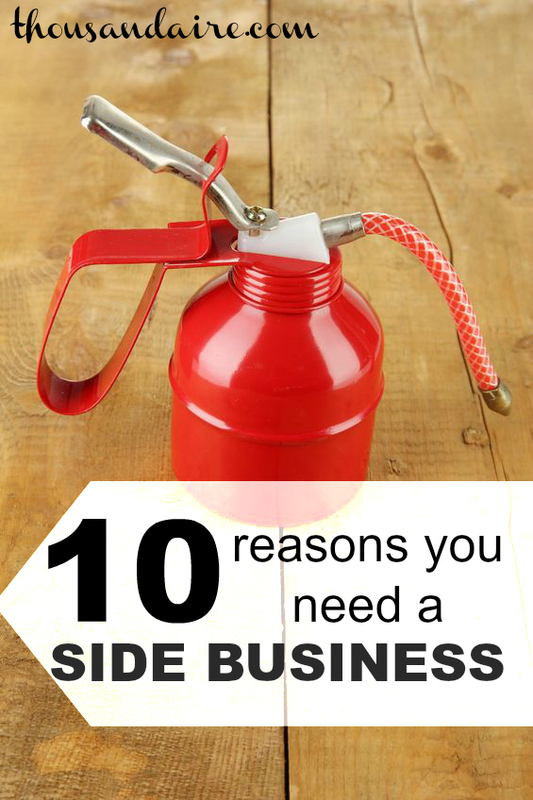 If you don’t have a side business (whether it’s a blog, lawn mowing service, tech support for old people or a lemonade stand) then here are 10 reasons why you need to get started today! 10. Cavemen Are Jealous of Free Time – A few thousand years ago people literally spent their entire day lives looking for, gathering and hunting food. Today most of us have cabinets and refrigerators stocked with plenty of food. If the cavemen knew people were using “free time” to sit on a couch, they would be offended. 9. Diversification of Income – If I lost my day job today I’d still be making some income through this website. We diversify investments all the time to mitigate risk; why not diversify income for the same reason? 8. Play Money is Fun to Play With – Extra money means you have the ability to do extra stuff. You could do something responsible like invest it, or you could take your extra “play money” and play with it. Vacations and toys (electronics/tools for men and shoes for women) are a lot more fun when you don’t feel guilty for spending money on them. 7. Watching TV is BORING – Seriously. Your brain is sick of consuming visual and audio content. It wants to create something. A business, a website, a painting, something! Bonus: if you create something awesome, you can make money off it. 6. Additional Skills Make You More Valuable – No matter what side business you start, you’re going to learn something. Whatever skills you learn could very well help you get a raise, promotion, or even your next full-time job. 5. MONEY!!! – I’ve already touched on this briefly, but seriously. More money = more awesome. 3. Business Expenses Rock! – I’m flying to Denver to hang out with all of my blogging buddies for four days in September at FINCON. My plane ticket, hotel, food and drinks, and everything else on the trip are business expenses and reduce my taxable income. Sweet! Special thanks to Jeff from Sustainable Life Blog for the idea. Make sure to check out Jeff’s blog if you get a chance! Readers: If you have a side business, add another reason to the list why it’s so awesome. If you don’t have a side business, what’s stopping you? 11. It provides a profitable way to practice all the things you love (and are qualified to do) .I have a degree to teach 7-12th grade language arts. I love reading and writing but found a job teaching public speaking and debate. I love my job, but I miss other parts of my field.I do freelance work writing for different blogs, maintain my own blog, write for one of those study guide websites, administrate summer programs, and do some private tutoring (not usually all at the same time though of course). My business card simply says:”Reading+Writing+Speaking Education and Services”All these little side projects give me extra income and provide a financial safety like you explained but they also provide opportunities for me to practice the full scope of my degree and do all the things I love. Thanks for the shoutout kevin – and great reasons. For me the ones that ring truest(?) are 7, 9, 6 and 4. The most pressing one is probably tv though – people ask me all the time how I do so much stuff, then I tell them I watch like 4-6 hours of tv a WEEK and they fall over. Hmmm, my understanding is that hunter-gatherers actually worked far less than we do now. I think I remember a 4 hrs/day or less figure, but I don’t have a reference. My husband and I watched the first Twilight movie last month because we wanted to see what all the fuss was about. And… wow. Wow. That is a bad movie! A terrible movie and a poor, unrealistic (even accepting the premise) story. I think point 6 is the most important for me at the moment with respect to blogging. I’m thinking of transitioning from scientific research to some kind of writing field so I think blogging helps keep my skills a bit more fresh. In any case, great list. Linked over from Afford Anything…great blog there, as well!The demographic that could change the world starting a new business are the baby boomers. Retired people have all the right tools to become entrepreneurs — time, experience, and money.I read an AARP survey that found that the time spent watching TV goes up 70% after a person retires — 70%. How many hours you figure that is? Retired people could benefit greatly from the ideas in this post — thanks! now now, no need to be sexist. Great timing (for me personally) on this post! Just last night my boyfriend and I registered to be sellers on Etsy, and made plans to take our used clothing to sell at the nearby secondhand store, and I bought the domain name for my soon-to-be blog. It seems like these days, there are a million ways to make extra money– You just have to do *something* to get it moving. Haha these are great points. I especially like numbers 10 and 4. I’ve often thought about how we have so much more time now than the cavemen did, and we are able to learn more and create: I just think it’s our duty to take advantage of that! For me, it is staying engaged, interacting with readers and commenting on other sites. The money is nice, but not my main motivation. Cavemen will be jealous?! That’s the best reason ever! I too loved the caveman lead in, classic!The side business has been a great insurance policy for a rainy day, a way to save faster, a source of fun money and now a full time gig for me. I recommend everyone start some type of side business, even if it is something as simple as selling your homemade oatmeal raisin cookies that everyone raves about. The best thing about a side business is that it could be a skill you have but never thought you could monetize. Example: I’m an Apple nerd so I’ve jailbroken several of my own iPhones and know a lot about the process. Recently, an acquaintance told me he’d give me $20 to jailbreak his, so on a whim I put up a Craigslist ad in my town describing my jailbreaking services, and have now earned nearly $100 extra in the past month with a minimal time input.